We’ve been making color choices since we were kids, from the day someone gave us our first box of crayons. And remember how much fun it was! Who cared if the horse was purple and the cat was green? As adults we seem to be intimidated by it. We can spend hours picking the right color suit or dress. And a new car? Easily a couple of trips back to the showroom floor for another look. And picking a siding color for your home, a decision you’ll live with for years? Well, it’s as if memories of that purple horse suddenly gallop into consciousness, and our color confidence slips. Yes, it’s definitely something we want to think about some more. 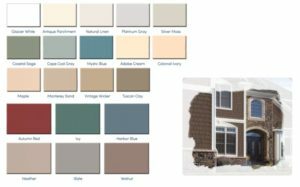 That’s why we’re using Alside simple, two-step guide to help you choose siding and trim colors for your home. This guide makes the process simple. Reassuringly simple. You’ll get some basic color design considerations to think about. And some simple guidelines and rules of thumb. And some beautiful color choices to give you a few ideas what your home may look like. If you like the color scheme of your home. First, consider an obvious possibility: You love the current color scheme of your home. If that’s true, relax. Most of the work is done. Just find the Alside color below that most closely matches your home. Then consider the possibility of changing trim colors. Even a small change can create a whole new look for your home. Step 1: Where to begin. If you want to begin all over. Second possibility: You would like to explore a different color scheme for your home. Start with your roof color. This is the starting point for homeowners who want to change their current exterior color. And to make that change, start with the part of your house that’s not going to change – your roof. You’re going to replace the roof too? Start there anyway. Let the roof serve as a backdrop for your primary siding and trim choices. 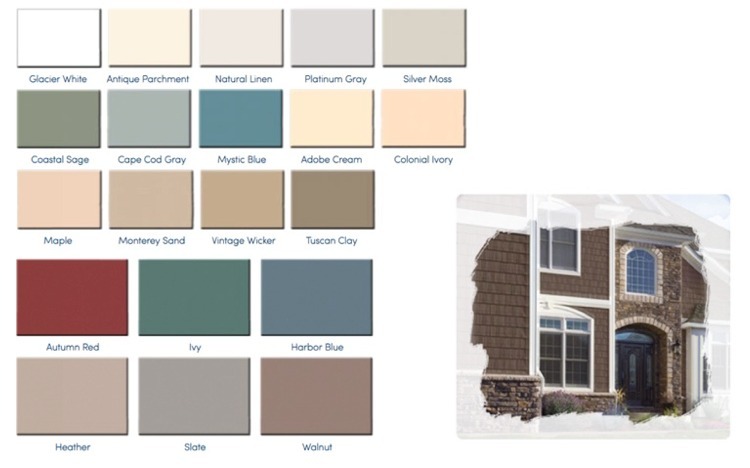 For optimum visual appeal, roof and siding colors should be compatible. 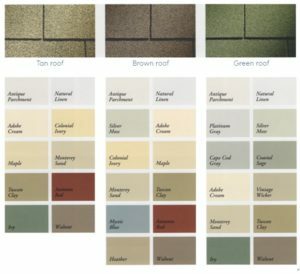 Find a roof color similar to your current or planned roof. Select a color from the suggested options. We didn’t include white in our color suggestions because it’s a basic color that works well with any roof. Use the “Design Your Perfect Home” Virtual Showroom – color visualization tool, click here. Step 2: Select trim colors. Select either comparable or contrasting colors. Once again, it’s a simple process, involving just two basic choices. Decide if you prefer trim in Comparable or Contrasting colors. Siding and trim colors identically or closely match. Consider comparable colors if you want to blend framework and architectural detail. Trim colors create subtle or bold contrast with siding color. Consider contrasting colors if you want to emphasize framework and architectural detail.